HEBREWS 4:12 KJV "For the word of God [is] quick, and powerful, and sharper than any twoedged sword, piercing even to the..."
9There remaineth therefore a rest to the people of God. 10For he that is entered into his rest, he also hath ceased from his own works, as God did from his. 11Let us labour therefore to enter into that rest, lest any man fall after the same example of unbelief. 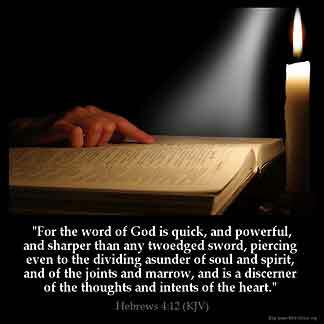 12For the word of God is quick, and powerful, and sharper than any twoedged sword, piercing even to the dividing asunder of soul and spirit, and of the joints and marrow, and is a discerner of the thoughts and intents of the heart. 13Neither is there any creature that is not manifest in his sight: but all things are naked and opened unto the eyes of him with whom we have to do. 14Seeing then that we have a great high priest, that is passed into the heavens, Jesus the Son of God, let us hold fast our profession. 15For we have not an high priest which cannot be touched with the feeling of our infirmities; but was in all points tempted like as we are, yet without sin. For the word of God is quicke and powerfull, and sharper then any two edged sword, pearcing euen to the diuiding asunder of soule and spirit, and of the ioynts and marrowe, and is a discerner of the thoughts and intents of the heart. For the word of God is living and full of power, and is sharper than any two-edged sword, cutting through and making a division even of the soul and the spirit, the bones and the muscles, and quick to see the thoughts and purposes of the heart. For the word of God is living, and powerful, and sharper than any two-edged sword, piercing even to the dividing asunder of soul and spirit, and of the joints and marrow, and is a discerner of the thoughts and intents of the heart. For God's Message is full of life and power, and is keener than the sharpest two-edged sword. It pierces even to the severance of soul from spirit, and penetrates between the joints and the marrow, and it can discern the secret thoughts and purposes of the heart. For the word of God is living, and active, and sharper than any two-edged sword, and piercing even to the dividing of soul and spirit, of both joints and marrow, and is able to discern the thoughts and intentions of the heart. and spedi in worching, and more able to perse than any tweyne eggid swerd, and stretchith forth to the departynge of the soule and of the spirit, and of the ioynturis and merewis, and demere of thouytis, and of intentis and hertis. 4:12 For the word of God - Preached, #Heb 4:2|, and armed with threatenings, #Heb 4:3|. Is living and powerful - Attended with the power of the living God, and conveying either life or death to the hearers. Sharper than any two - edged sword - Penetrating the heart more than this does the body. Piercing - Quite through, and laying open. The soul and spirit, joints and marrow - The inmost recesses of the mind, which the apostle beautifully and strongly expresses by this heap of figurative words. And is a discerner - Not only of the thoughts, but also of the intentions. Heb 4:12 For the word of God. The Israelites came short because they refused to hear the word of the Lord. If we could enter in, we must take heed to the word. It is quick, and powerful, and sharper than any twoedged sword. Cutting keenly and in all directions. Piercing even to the dividing asunder of soul and spirit. It not only gives life, but slays, as was the case with the Israelites who fell in the wilderness, and pierces to the soul and spirit. It reaches the very fountains of life. A discerner of the thoughts and intents of the heart. It lays bare the thoughts and the intentions. such a wonderful scripture .I too am so satisfied to know all the words to be the word and the work of God. the greastest book every if you want to know God himself you must get acquainted with the bible. Further proof from the scriptures that the Bible is relevant today. It is unlike any other book, that is the oldest, and has survived many attacks to extinguish it. Even today, when individuals read this book they are moved to make changes in their life, and dedicate themselves to God, and his will. Very powerful words are found in the Bible, and despite its age, it still has a powerful impact! Could we expect anything less from it 's author Jehovah God? I am the worst sinner i know of. The Word of God has shown me myself. The desperate depravity of wickedness that prevents me from the glory of God 's goodness and His righteousness. The Word discerns every thought and intent, that, "every imagination of the thoughts of 'my 'heart are only evil continually. " And that, "i know that in me, that is, in my flesh, dwelleth no good thing. " And "when i would do good, evil is present with me. " The Word declares these things, not only of me myself and i, but of all mankind, born in the fallen image of Adam. And so those whom God has put His Spirit within the Witness of "the Word, which became flesh and dwelt among us, " and that Spirit is the Spirit of Christ, those blessed sinners, foreknown, predestined, called, justified, sanctified,and glorified,these possess the discernment of the Word, Christ Jesus. He who needed not that any man should tell Him anything. For He already knows what is in man. I believe in this passage for his word is who he is and that is god and he see what is truly in the heart of a person we can fool him we say one thing but or heart tells him the truth and the heart is our soul and the real way to god our temple is our body we just have to be real in are faith which only god knows who we are .